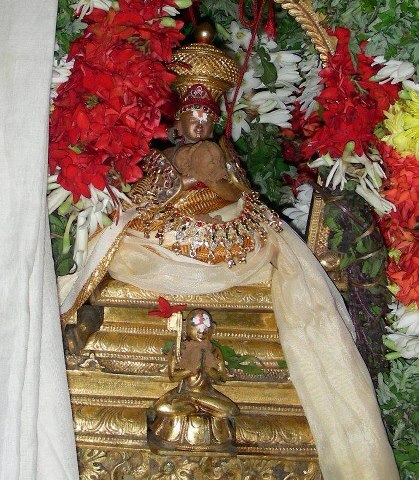 Our srIvaishNava sampradhAyam is called ubhaya vEdhAntha sampradhAyam. We are blessed with samskritha vEdham/vEdhAntham (4 vEdhams, upanishadhs, brahma sUthram, smruthis, ithihAsa/purANams, pAncharAthram) and dhrAvida vEdham/vEdhAntham (AzhwArs dhivya prabhandhams, pUrvAchArya vyAkyAnams for dhivya prabhandhams) as the two eyes of our sampradhAyam. Both are equally glorified and cherished. Any one focussed in realising the true nature of the self should study and learn both samskritha and dhrAvida vEdhAnthams. srIman nArAyaNa is paramAthamA, the supreme being - greater than all beings. He is the object of vEdham and the one who reveals the vEdham time and again. He is cause of the entire creation (which contains infinite universes) - he is upAdhAna (material) cause, nimittha (efficient) cause and sahakArikA (ancillary) cause. All sentient/insentient beings are borne by, controlled by and subservient to him. His mercy is our sole refuge. Service to him and his divine consort srI mahAlakshmi is the ultimate goal. These above principles that are not understood by our senses, are revealed through ubhaya vEdhAntham. srI rAmAnuja appeared in this world out of his causeless mercy to uplift the jIvAthmAs from this samsAram. Following in the foot steps bOdhAyanar, tankar, dhramidar, etc., he expertly explained the principles of samkritha vEdham/vEdhAntham in his divine works. All his literary contributions are in samskritham. His most masterful srI bhAshyam - vyAkyAnam for brahma sUthram clearly established the visishtAdhvaitha philosophy. But to explain the principles of brahma sUthram, srI bhAshyakArar uses the divine srIsUkthis of nammAzhwAr (and other AzhwArs). This is explained by azhagiya maNavALa perumAL nAyanAr in his Acharya hrudhayam 65th chUrNikai - "bhAshyakArar ithu koNdu sUthrangaLai orunga viduvar" (பாஷ்யகாரர் இது கொண்டு ஸூத்ரங்களை ஒருங்க விடுவர்) - bhAshykArar uses the divine knowledge that is available in thiruvAimozhi to establish the meanings of the sUthrams eliminating all doubts. By clearly explaining the ultimate principles of sAsthram he ignited the light of knowledge and dispelled the darkness of ignorance. Subsequent to his times, nadAthUr ammAL continued lecturing and propagating these divine principles. srutha prakAsikA bhattar wrote a detailed commentary for srI bhAshyam based on what is heard/understood from his kAlakshEpa AchAryan - nadAthUr ammAL. This commentary became to be known as srutha prakAsikai and was to the size of 36000 granthams. 1 grantham = 1 padi = 32 vowels. 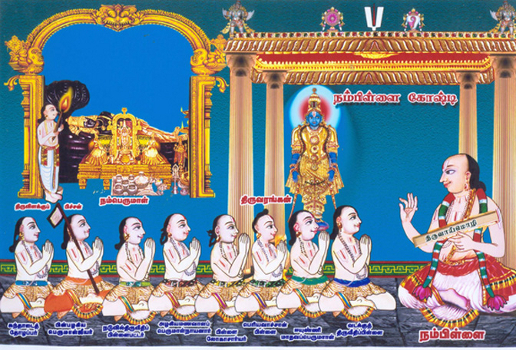 There are five vyAkyAnams for thiruvAimozhi that exist until today. Of these, 36000 padi vyAkyAnam is called "eedu" vyAkyAnam which means "uncomparable". This matches the srutha prakAsikai in size (36000 padi). This was written by vadakku thiruvIdhi piLLai without getting prior permission from nampiLLai. nampiLLai once happens to observe this vyAkyAnam and he becomes amazed by the beautiful style and elaborate nature of the vyAkyAnam. He takes it away from vadakku thiruvIdhi piLLai and says that it is not the appropriate time to reveal/release this vyAkyAnam yet to everyone. Then, he hands over the vyAkyAnam to eeyuNNi mAdhava perumAL and asks him to teach it personally to deserving disciples. 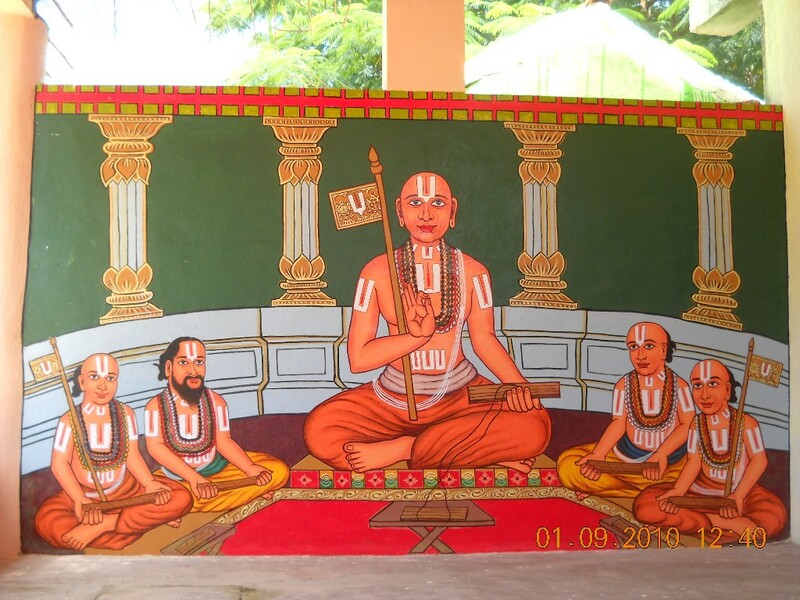 nampiLLai also highlights that in the future srI rAmAnuja will re-appear as another AchArya (mAmunigaL) and he will bring out the full glories of this vyAkyAnam. Thus, this vyAkyAnam gets passed on from eeyuNNi mAdhava perumAL to eeyuNNi padmanAbha perumAL to nAlUr piLLai to nAlUr AchAn piLLai to thiruvAimozhi piLLai to maNavALa mAmunigaL finally. Under the divine orders of namperumAL (srI ranganAthan) himself, this eedu vyAkyAnam was then discoursed in public by mAmunigaL. So, per the divine desire of namperumAL, the vyAkyAnam which was taught privately to selected disciples was discoursed by mAmunigaL in front of namperumAL in periya kOil for a whole year leading up to Ani thirumUlam sARRumuRai (conclusion) and srI sailEsa dhayApAthram thanian dedication by namperumAL to mAmunigaL and accepting mAmunigaL as his own AchAryan, completing the OrAN vazhi AchArya paramparai. 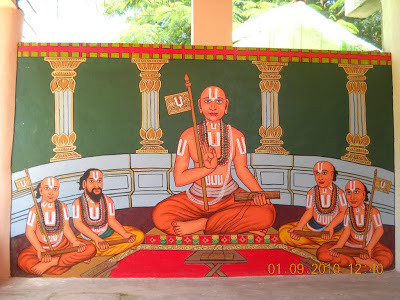 nampiLLai, whose thiruvAimozhi lectures are documented by vadakku thiruvIdhi piLLai in the form of eedu 36000 padi vyAkyAnam, is an expert in ubhaya vEdhAntham. 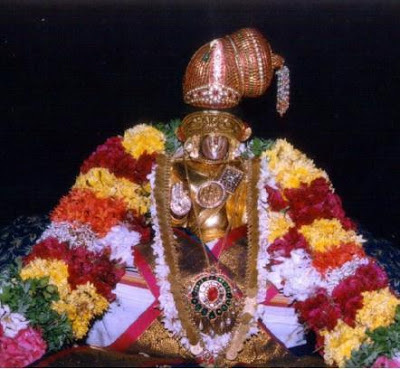 He accepted the mantle of leadership of our sampradhAyam from nanjIyar and was head quartered in srIrangam. His knowledge in ubhaya vEdhAntham is unparallel. Our sampradhAyam grew into great heights during his time. Unlike many other AchAryas' times where there was external disturbance, etc., nampiLLai's time in srIrangam was absolutely trouble free. srIvaishNavas during his time was the most fortunate as they were fully submerged in bhagavath anubhavam. Many attended his lectures regularly. Once, a vaishNava king observed the crowd dispersing after a lecture of nampiLLai and wondered if it was namperumAL gOshti or nampiLLai gOshti. Not only he was most knowledgable, he was most humble too. He was fully surrendered to his AchAryan nanjIyar and their dealings/conversations are most relishable for srIvaishNavas. It was this rare combination of complete brilliance and utmost humility which earned him the title lOkAchArya. Let us see that incident briefly. Once in front of namperumAL, kandhAdai thOzhappar (who comes in the lineage of mudhaliyANdAn) says some harsh words towards nampiLLai. He was not able to appreciate the glories of nampiLLai and that came out as harsh words. nampiLLai did not say a word, accepting the insults silently left the temple to go to his thirumALigai (residence). When thOzhappar went to his thirumALigai, his wife who already heard the news from others gave him strong advice on his behaviour and explained the glories of nampiLLai. She insists he should go and apologize at the lotus feet of nampiLLai. Finally he realized his mistake and decides to go to nampiLLai’s thirumALigai late in the night. When he opened the door to go, he noticed there was a person waiting there and that was none other than nampiLLai himself. nampiLLai seeing thOzhappar, immediately falls down and offering his praNAmams and says that he had committed some mistake which caused thOzhappar to be upset with him. thOzhappar was shocked to see nampiLLai’s greatness – even though it was thOzhappar who committed the mistake, nampiLLai was gracious enough to take up the fault on himself and apologise. thOzhappar immediately offered his praNAmams to nampiLLai and said from then on nampiLLai will be called “lOkAchAryar” because of his great humility. lOkAchArya means the master of the whole universe. He said only some one with great humility even after being such a great personality can be called lOkAchAryar and nampiLLai fully fits that position. thOzhappar also gives up his hatred towards nampiLLai and starts serving nampiLLai with his wife and also learns all the meanings of sAsthram from him. mAmunigaL quotes this incident in his upadhEsa rathina mAlai and glorifies both thOzhappar and nampiLLai and from that itself we can understand nampiLLai’s purity. We can also understand thOzhappar became pure by associating with nampiLLai after this incident. Here in this pAsuram, thirumangai AzhwAr is glorifying sAndIpani who is kaNNan emperumAn's AchAryan. To explain how an AchAryan should be, periyavAchAn piLLai highlights the qualities of nampiLLai and shows that he is the perfect AchAryan to follow. Simple translation: A true AchAran should be like nampiLLai who can fully educate his sishyas by - first hearing the meanings of dhvaya mahA manthram, then learning ithihAsams and purANams, then learn nyAya, mImAmsa, etc to understand other sidhAnthams and to establish our own sidhAntham and spends his own time by always engaging in discussing AzhwArs' dhivya prabhandhams and their meanings. nampiLLai's lectures are so mesmerizing. He usually sat on the eastern side of the prAkAram (layer) close to periya perumAL's sannidhi. It is said that periya perumAL lifted himself up and tried to have a vision of nampiLLai but periya perumAL's confidante servitor named thiruviLakkuppicchan pushed him back onto his Adhi sEshan and asked him maintain his archA samAdhi. 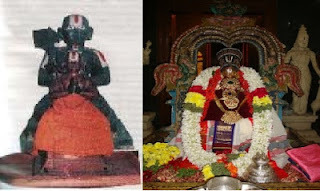 nampiLLai's full glories and life history can be read at http://guruparamparai.wordpress.com/2012/09/16/nampillai/. nampiLLai's eedu vyAkyAnam is the most comprehensive source for the established principles of our sampradhAyam. From the incident involving naduvil thiruvIdhi piLLai bhattar - pinbhazhagiya perumAL jIyar in the king's court where naduvil thiruvIdhi piLLai bhattar explains the principle of srI rAma's ability to give mOksham to jatAyu using nampiLLai's explanation and naduvil thiruvIdhi piLLai bhattar's subsequent reaction and surrender to nampiLLai, we can understand that even a single word of nampiLLai lOkAchAryar is worth of unlimited wealth. This can incident can be seen in naduvil thiruvIdhi piLLai bhattar's vaibhavam at http://guruparamparai.wordpress.com/2013/04/20/naduvil-thiruvidhi-pillai-bhattar/. Note: Part of this introduction is based on srI U. vE. VV Ramanujam swamy's article which was written based on a lecture srI U. vE. 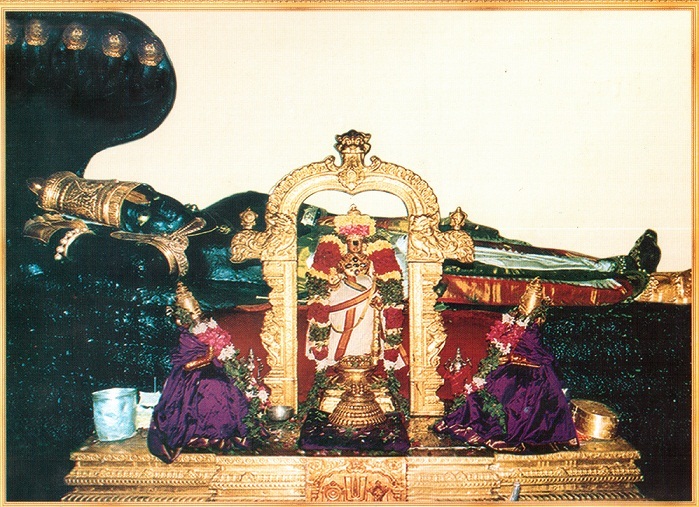 kArappangAdu venkatAchAryar swamy and srI U. vE. sathAbishEkam gOvindha narasimhAchAryar's article. Swamin, thank you for compiling this excellent and valuable grantham. Do you know where I can get a complete text for eedu vyAkyAnam? Please visit srIvaishnavasrI store in srIrangam or mAmbalam (chennai) - their website is http://srivaishnavasri.com. You can also try in puthur sudharsanar swamy press. They would have the full text.